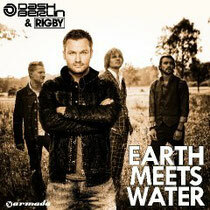 After announcing his new album (to be released this summer), Dash Berlin recently revealed the first track from it – ‘Earth Meets Water’, a big track that went down well at A State of Trance in Utrecht this year. Dash’s commitment to big vocals and driving beats has kept him afloat as a highly regarded artist with a very recognisable and popular sound. The sound of Dutch band Rigby could be described as sweet, pure, and full of bittersweet emotion and there are enough musical areas where these two artists overlap to make for a decent collaboration, and it’s precisely the subtle differences in their respective sounds that make ‘Earth Meets Water’. The essence of both contributors is equally felt, so as Armada gets set for its 21 April release, have a listen for yourself below.